The name Bishan Singh Bedi conjures up one of the finest bowling actions in cricket-poetry in motion. The most successful of India's legendary spin quartet of the 1970s, Bedi played 67 Tests and picked up 266 wickets, making him the highest Indian wicket-taker at the time. He was a master of deception who combined variations in flight, spin and pace to beguile the best of batsmen. Playing at a time when Indian cricket was just coming into its own, he featured in the incredible Indian victories in England and in the Caribbean in the 1970s. 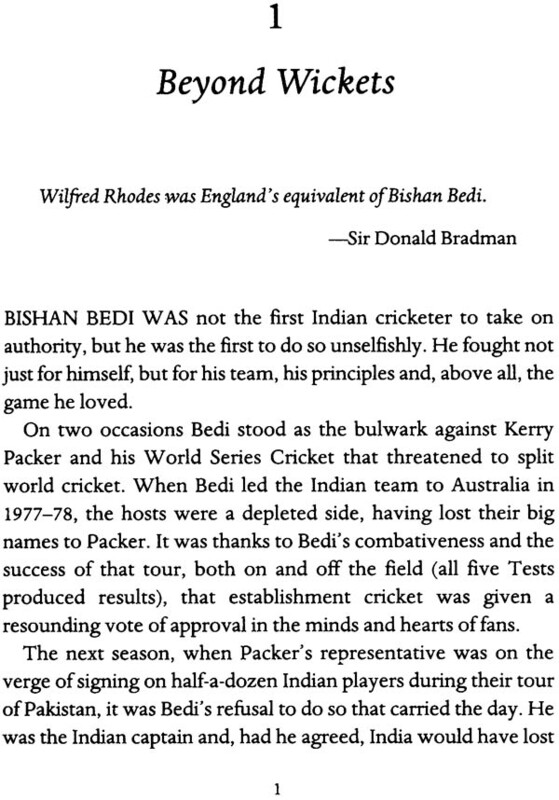 There has always been more to Bedi than spin bowling. Forthright and outspoken, he clashed with officialdom as he crusaded for players' rights. 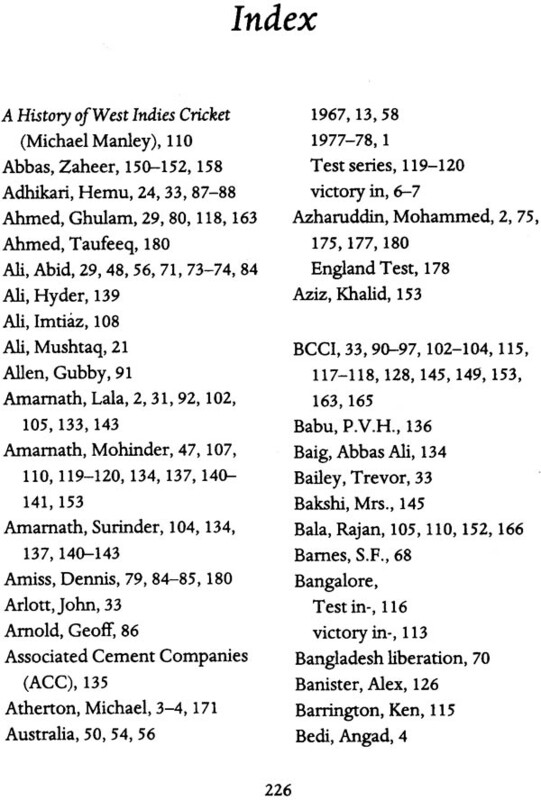 He was also dogged by controversy, provoking extreme responses to his actions: objecting to the use of Vaseline by John Lever, declaring India's second innings at Kingston in protest against intimidatory bowling by the West Indians and, famously, calling Muttiah Muralitharan a chucker. 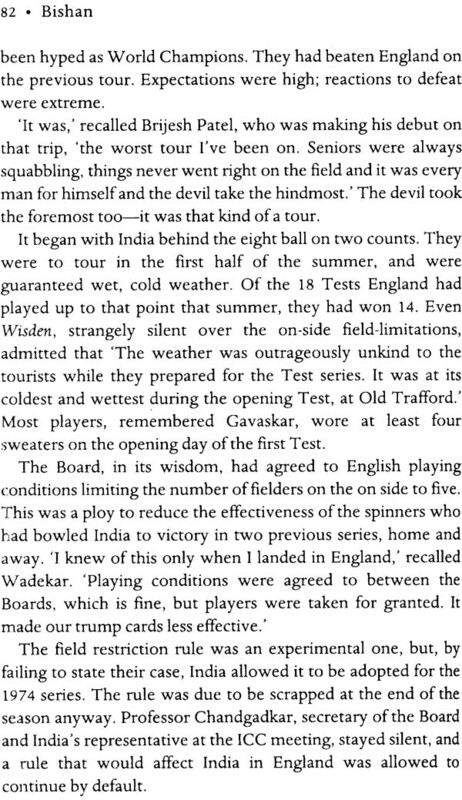 This portrait by Suresh Menon, one of India's finest sports writers, is a remarkable account of an astonishing character -a true cricketing great whose zest and passion for the game remain undiminished. Suresh Menon, one of the youngest newspaper editors in India, is widely regarded as the most literary of India's cricket writers. A Bangalore University topper in economics and political science, Menon began his career with the Deccan Herald before moving to the Indian Express, Chennai, for which he reported the cricket series in Pakistan and New Zealand in the 1980s, and wrote the first of many weekly columns. Suresh was still in his twenties when he became sports editor of the Pioneer and then sports editor of the undivided Indian Express in New Delhi. He was the highest paid sports writer in the country when he decided to shift focus and accepted an offer from Gulf News, Dubai, and helped raise its profile from a local newspaper to its current international status. In 2000 Suresh took over as editor of the New Indian Express in Chennai, and launched the New Sunday Express. He quit in 2002, to honour book-writing commitments, but the temptation of daily journalism proved too strong. He launched a newspaper in Bangalore, which then became the state's highest selling, and was bought over by the Times of India group. Through it all, Suresh has continued to write columns on a range of subjects-politics, cricket, literature, humour and sport-for a range of publications in India and abroad. Bedi is unique. As a cricketer, as a person and as one of the most pleasing sights you can hope to see at the bowling crease. He enjoys his cricket, enjoys the poetry of the game and hopes to see only good things on the field of play. He has always focused on the unwritten laws of cricket, on the importance of playing the game the way it should be. He was the coach on my first tour, in 1990, to England. At Old Trafford, I didn't manage to catch a stroke off skipper Kapil Dev's bowling. Jonty Rhodes might have got there, but he would have had to be at his best. Kapil yelled at me on the field, and I was so upset I broke down. I was just nineteen then. Later that day, Bedi came up to me and said, 'Young man! Never shed tears in public.' I don't know what he told Kapil, but there was no more shouting after that! I had arrived late for that tour after completing my university exams, and joined the team for the midnight drive to Birmingham where we played next. I was tired and slept badly. 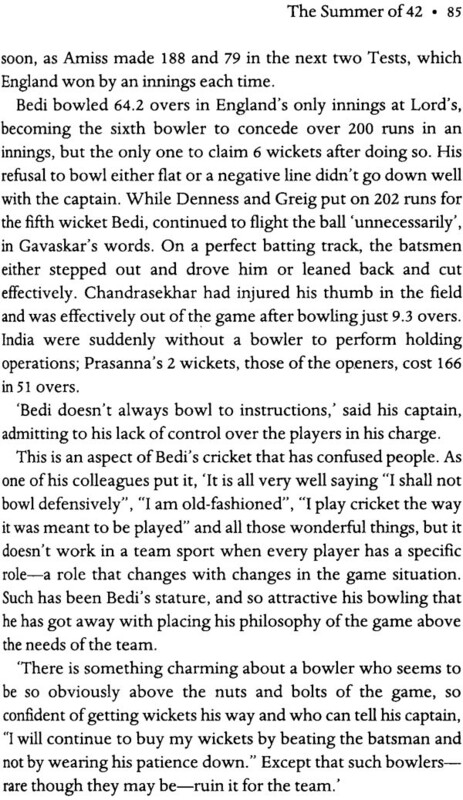 At the practice session the following morning, Bedi told me, 'You have weak legs, son.' His solution? To get Venkatapathy Raju to jump on to my shoulders and for me to run around with that weight. My back never recovered for the rest of the tour. 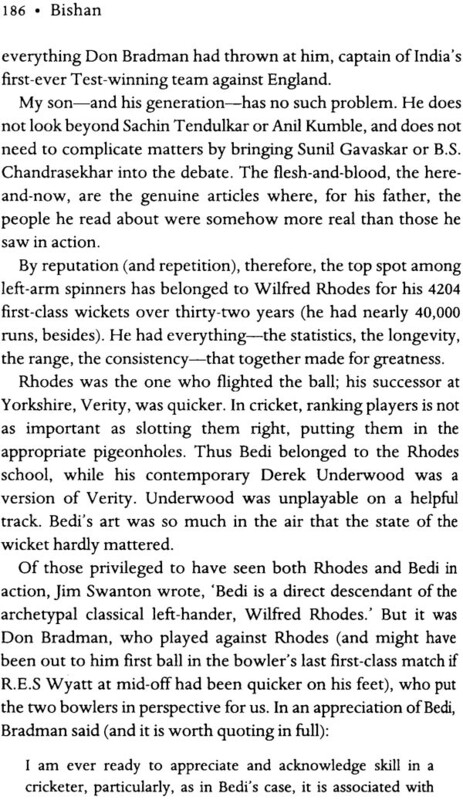 Bedi, the most orthodox of spinners, was an unorthodox coach. Hard work meant sweat and punishment. The reserves dreaded close of play, for then he would turn his attention to them and make life hell! But Bedi inspires confidence in his wards. He makes them feel comfortable. Basic skill aside, he looks for attitude. The approach to the game is important in his book. It is good to have the front foot in the right position or the transfer of weight done well, but it is more important to have the right philosophy. 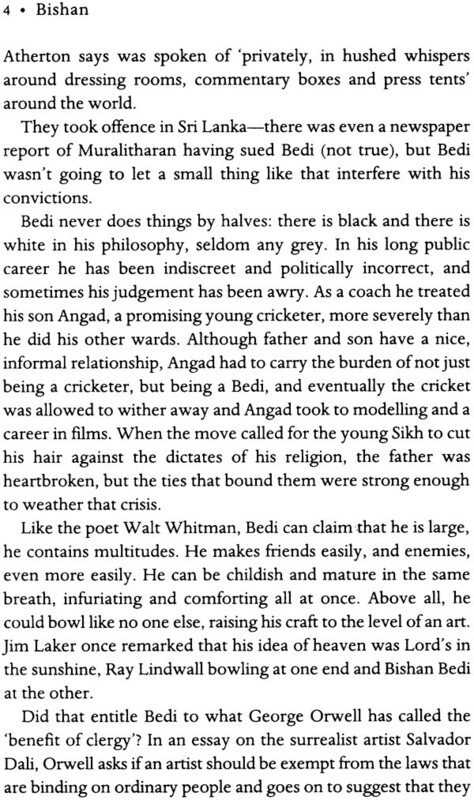 Bedi was, and remains, a treasure chest of knowledge, and expresses his opinions with stunning honesty. If you sit with him for a session, however brief and informal, you can then go about talking cricket. He is a university on the game. It is part of his charm that he is not even remotely diplomatic; his heart is in the right place though, and that's what matters. When I started playing, the romance and record of the Fabulous Four-Bedi, Erapalli Prasanna, my mentor Bhagwat Chandrasekhar and S. Venkatraghavan-inspired all the spinners. It was a legacy that we hoped to emulate and extend. Comparisons were made, records were checked; it was never easy to fill such shoes. I feel proud to be part of that continuing tradition. 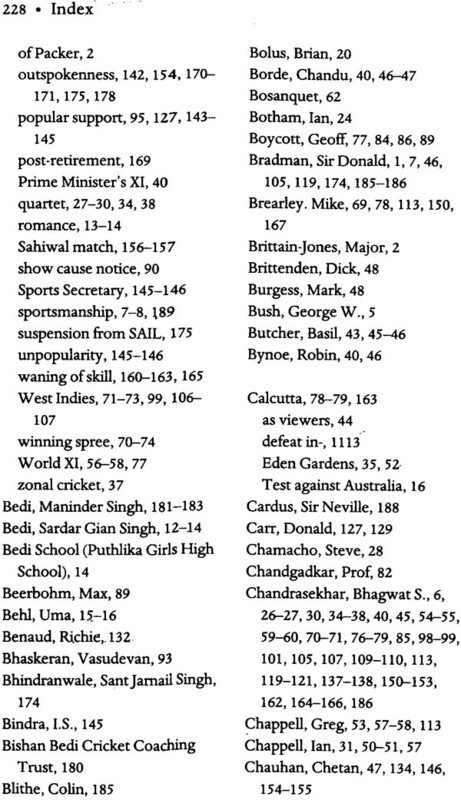 From the early days, Bedi followed my career. He would call me up, encourage me or, if need be, berate me. He continues to do so, and I consider that a privilege. Bedi calls it like it is. This is one quality he shares with the author of this book, and I think, for once, the subject and writer are perfectly matched. Suresh and I go back a long way; he was already a well-established commentator on the game when I made my debut. I enjoyed seeing Bedi, a great cricketer, through Suresh's eyes. 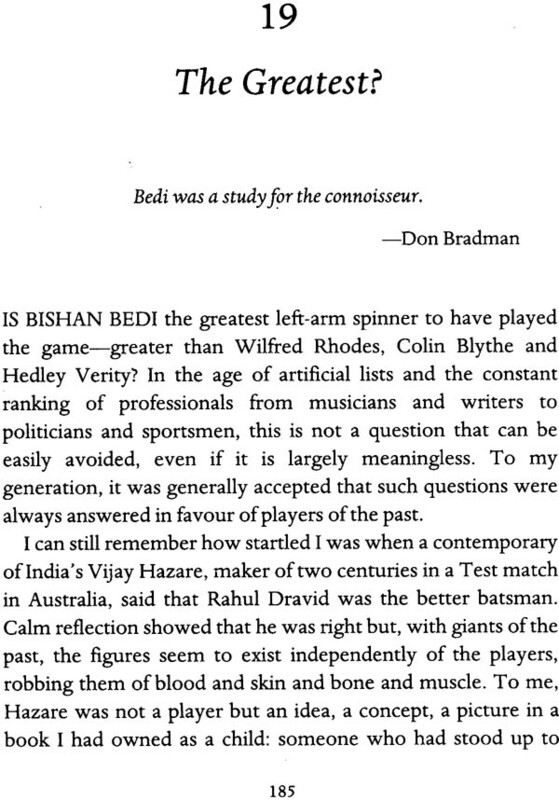 'I HEAR YOU are writing a biography of Bishan Bedi. Have you heard of the time when ... ' and the speaker would launch into a story that might verge on the edge of authenticity or topple over into the realm of the incredible. Surely Bedi didn't actually say that? But all stories are true, if not factually, then psychologically, and to pick one version would be to automatically limit the subject. 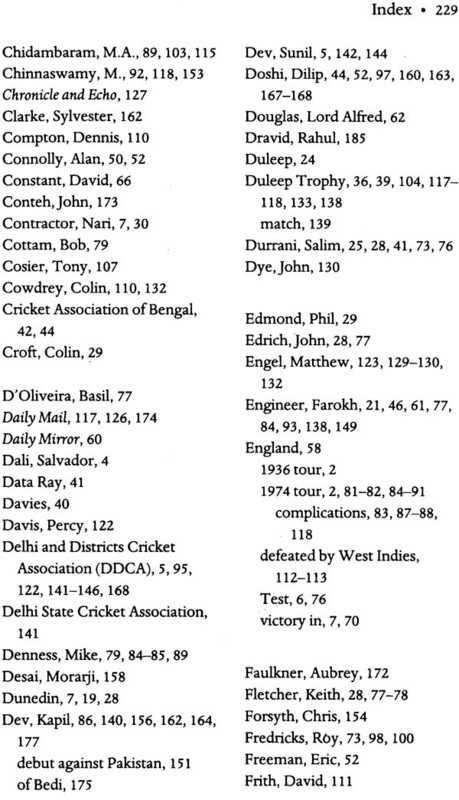 Some of the best stories about Fred Trueman (or W.G. Grace) are the apocryphal ones, told of him, about him and often by him, but with no basis in reality. Yet such stories tell us something about their subjects-they are the stories that seem 'typical' of them, and give us a picture of a slightly larger-than-life person: someone interesting enough to inspire tales. Did Trueman really tell a dining companion at a banquet in Asia, 'Hey Gunga Din, pass the salt?' 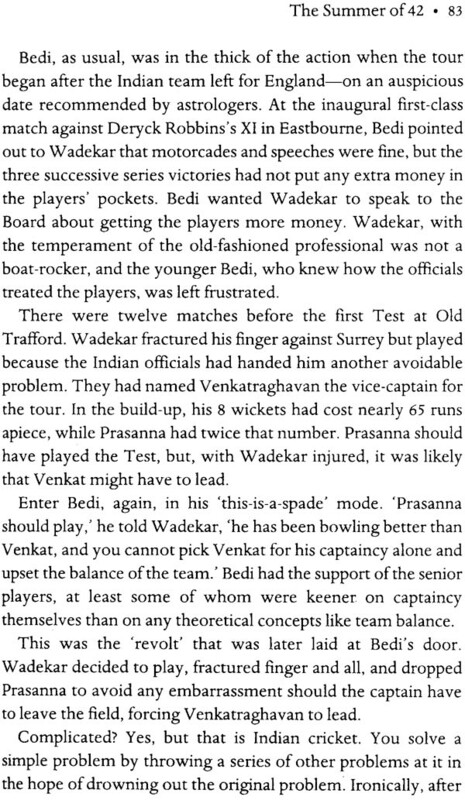 Did Bedi tell a reporter in Bombay that he would like to bury the cricket officials in Delhi so that, just as Bombay had a brick-based wicket, Delhi would have a Mehra-based wicket? It doesn't matter; the point is that these are accepted as the kind of things they would have said, and thus does the outline of a character emerge. Bedi never steps into the same river twice. Like a good raconteur, he colours differently every successive version of his favourite stories. It doesn't matter if he isn't the hero every time; Bedi loves a good story, and his motto is simple: anything for a laugh. Few men laugh as readily as Bedi does; few men cry as easily. He reacts to other people's good fortune cheerfully; he feels their misfortune deeply as well. 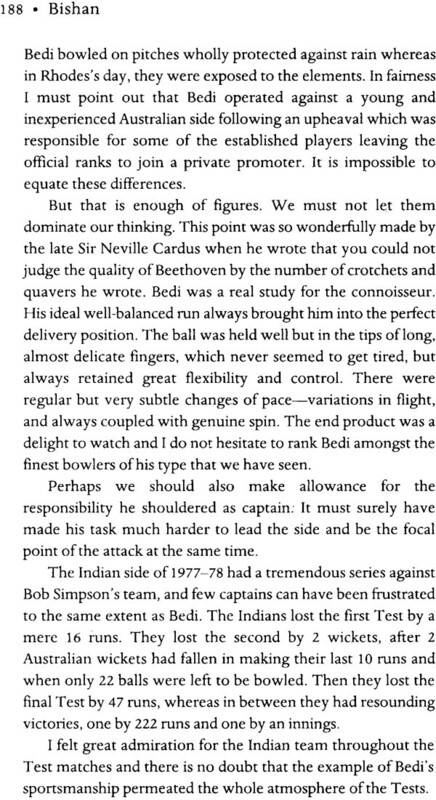 He bowled like a magician, charming batsmen out, and took the trouble to pass on what he had learnt to later generations. 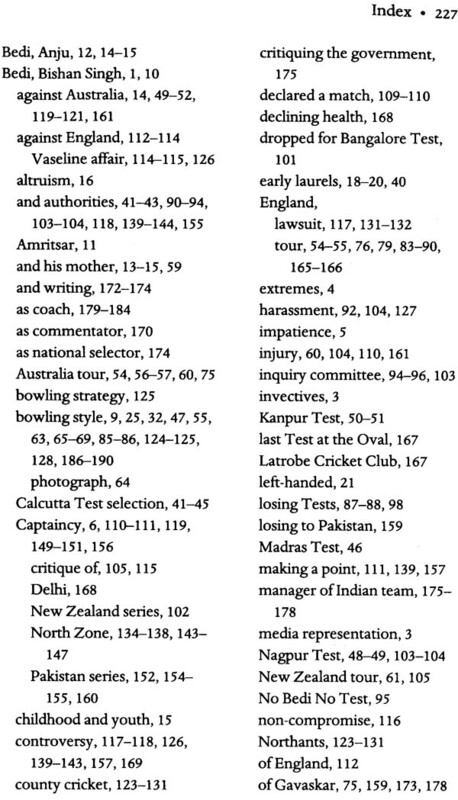 Yet the basic lessons he taught were philosophical rather than cricketing: Learn to respect the game. Work hard. Nothing comes on a platter. All great players have worked hard. Like most slightly larger-than-life figures, Bedi wasn't just one personality. Which Bedi do we focus on? Bedi the player, Bedi me man, Bedi the public image, Bedi the private individual, Bedi the rebel or an amalgamation of all these? Then there is the question of emphasis-is one more important than the other, one more 'typical'; is there one that dominates? It is rather like the blind men of Hindustan describing an elephant: everything depends on where you are standing and which of the personalities is turned towards you. The personas overlap occasionally, but often remain so out of touch with one another that a group of people could spend an evening talking without realizing they are referring to the same person. 'I met this large-hearted person: one might say. 'He dropped everything he was doing to rush to my son's bedside to donate blood-he has a rare blood group, you know-and saved his life.' A little later another might say, 'You should meet this guy, he is deeply spiritual and can quote whole passages from the holy book.' A third might attempt to lighten the atmosphere by talking about this commentator who cracked a joke on television while a fourth might put his arm around the conversation and gently guide it towards the story of the cricket coach who was so severe on his son that he gave up the sport. And so the evening would wear on, with no one realizing that they were all talking about the same person. 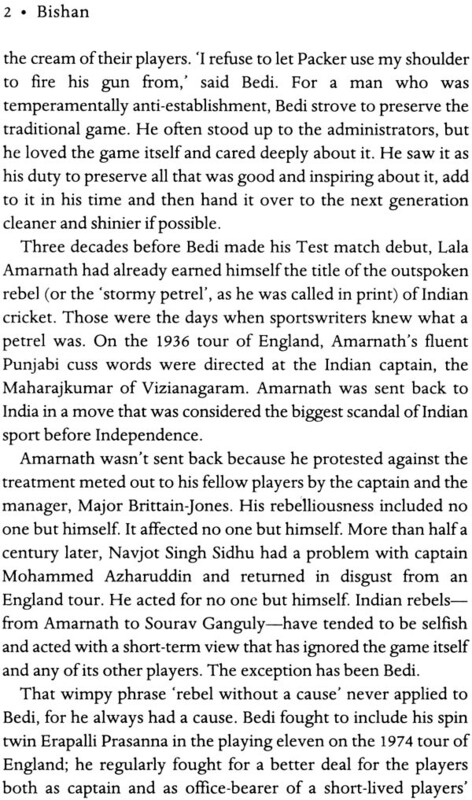 Beneath the various personas, the original boy from Amritsar still exists-under the public image, the various coats of rumour and myth and the stories of what others want Bedi to be. As he grows older, though, Bedi seems to be shaking off some of the deposits off able and fantasy, of folklore and legend, that have collected around the persona over the years, and re-emerging as the boy from Amritsar who found sustenance within himself. There is nothing he enjoys more than returning to the house where he was born, meeting up with friends who have known him all his life, and talking about the old days. Cricket is incidental to such conversations. Bedi's wife Anju says he is an 'extremist'-someone who deals in extremes. It is a good description. If he loves you, he will stop at nothing to help; if he dislikes you, there is nothing you can do to stop the flow of invective. The middle path is for practising Buddhists and those who lack the passion to truly love or hate-the twin emotions that merge into each other. Writing about Bedi, therefore, invokes the abstract artist's dilemma. It is this: How do you know when to stop? Do you add another dab of colour, another squiggle at the bottom of the canvas; do you have another go at getting the right colours nestling beside each other? 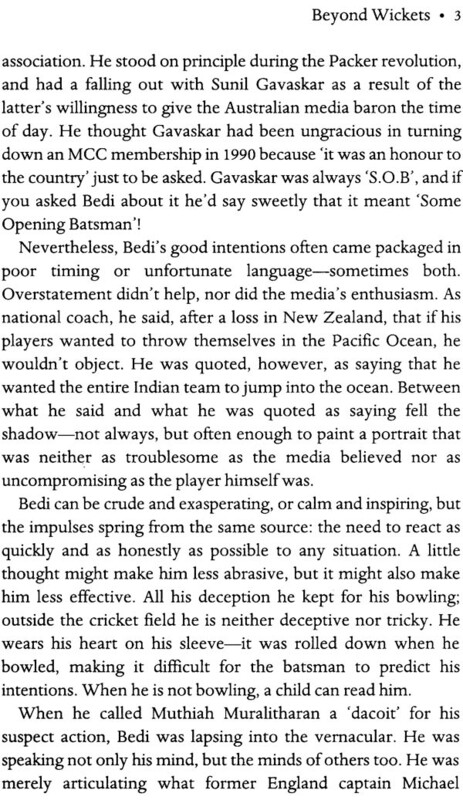 In Bedi's case it's a question of another story, another quote, another unexpected coming together of figures. You call someone up to double-check a fact, and the person gives you another anecdote. 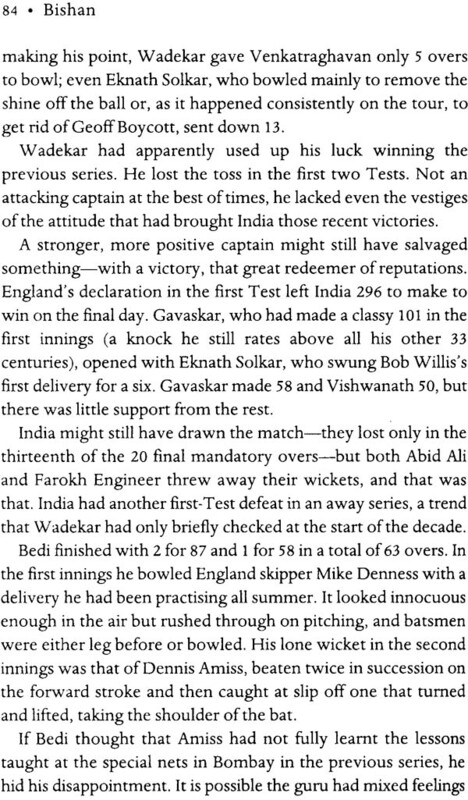 You speak to Bedi about the time he was brought on to bowl that lone over in the Oval Test, and he recalls something that happened in Australia a decade later. Joining the dots can be fun, but not as much fun as laying them out in the first place. Some years ago, while recuperating after a surgery, I had a chance to test H.G. Wells's dictum that the mind was the natural habitat of man. I was in intensive care, and there were no books or television. To relax, I had to travel inwards. And the image that helped was the poetry of Bedi's bowling. I could see in my mind's eye the easy run up, the fluid action, the follow through, and the half-jump that confirmed to the batsman that he had been had. I marvelled at the contrast between the gentle curve of the ball in the air and the vicious pace off the wicket. The rainbow makes a beautiful arc, but it is predictable. Bedi's arc was pleasing and, as a bonus, its effect was unpredictable. Bedi, the only Indian with over 1500 first-class wickets, claimed 266 wickets from 67 Test matches. It is necessary to descend to figures when discussing an artiste like Bedi only because, in sport, beauty without cruelty is a silly notion favoured by the long in tooth and short in memory. 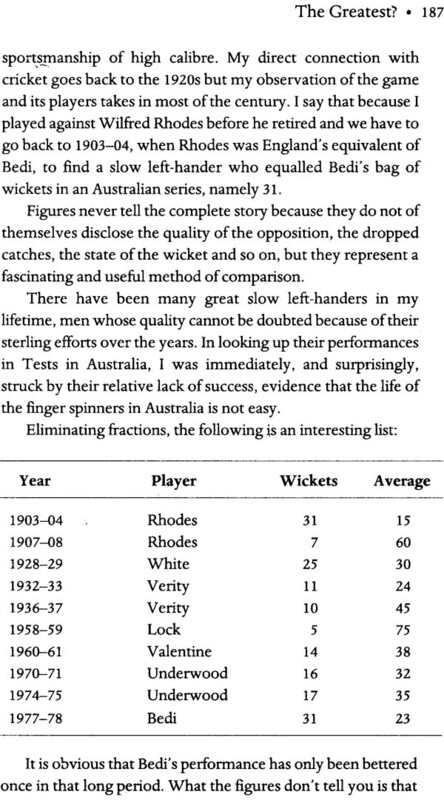 Every generation produces a great player who does not please the eye (Allan Border is a good example), but there is no great player who does not have the figures to show for it.